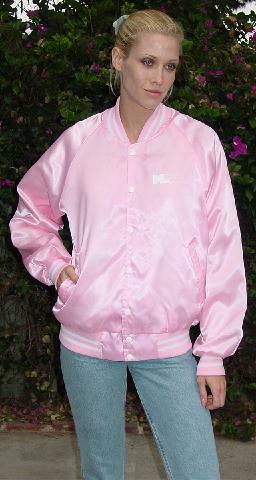 This vintage bright baby pink jacket has 7 white snaps down the front. It has raglan long sleeves with 2 1/4" stretch pink and white cuffs and a 2 5/8" wide stretch pink and white waistband. There are 2 slash diagonal pockets in the front. 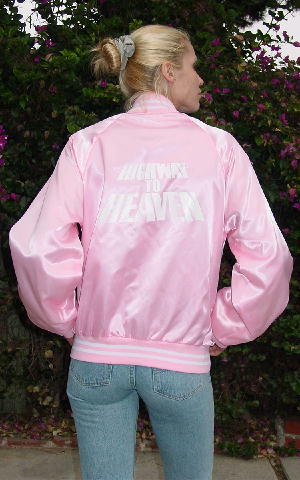 On the left chest panel in white letters is says "ML Michael Landon Productions" and on the back in white letters it says "Highway to Heaven". It's a real collector's item. It's from a Hollywood stylist's private collection. neckline to end of sleeve 31"
shoulder to bottom of waistband 25 1/2"